Join an unforgettable safari experience at an affordable price! On the safari, you will enjoy comfortable accommodations, awesome game drives, and more. So book your adventure now and make unforgettable memories happen. It is called a budget trip simply because Safari With Us has made the right arrangements with key suppliers and service providers that has enabled them to reduce the cost of the holiday without leaving the adrenaline of thrill and excitement while exploring South Africa's wilderness. Other than that, there is nothing budget about the big safari experience! During this safari, you will stay at Kruger Adventure Lodge for nights one to three. The accommodations come with en-suite rooms, air-conditioner or heaters, quality bedding and linen, DSTV, tea or coffee facilities, and all rooms draped in African decor. 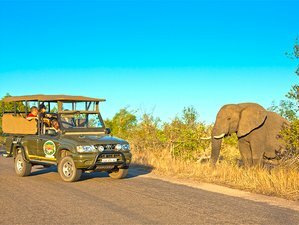 The Kruger Budget Safari departs daily from O. R. Tambo International Airport (JNB). You will need to be at the O.R. Tambo bus terminal by 07:30 a.m. Safari With Us will send you full instructions when you book your trip. The shuttle will depart no later than 07.45 a.m.
You will travel east, passing picturesque landscapes and farmlands en-route to the lodge near Kruger. There are two 15-minute comfort stops en-route. You will also be able to buy snacks and refreshments during those stops. ETA in Hazyview is around 01:00 p.m. The lodge driver will meet you at the drop off point and transfer you to the lodge. It will be a quick five to 10-minute drive. After checking in, you will have time to relax and freshen up before boarding an open-sided Landcruiser for an exciting two to two and a half hour sunset game drive in Kruger National Park. Even though the full day safari on the following day is the main day to search for the Big 5 and other wildlife, the Sunset Safari is a great introduction on what to expect. If you're lucky, you may also also get some lovely sightings including a wonderful sunset ! The lodge is about a 15 to 20-minute drive from the Phabeni Kruger Gate. After your safari game drive, you will return to the lodge where you can unwind, have drinks, and relax. Enjoy dinner and stay overnight. In the morning, you will enjoy coffee or tea and rusks before departing on a full day of game viewing in Kruger National Park, specifically the Skukuza area. A packed breakfast will be included. The game drives will be in small groups, in specially-modified and open-sided Land Cruisers. The Skukuza area is rich in wildlife and the elevated height of the four-by-four open-sided vehicles makes for excellent viewing and photographic opportunities. You can enjoy lunch at one of the park’s restaurants, on your own account. After lunch, you will start the afternoon game drive in Kruger National Park. During the game drives, you will see a vast variety of wildlife and have plenty of photographic opportunities. After the tour, you will make your way to back to the lodge or camp. Enjoy dinner and stay overnight. Lunch at Harries pancakes at own cost. It is the last day of your African Kruger Safari. You can enjoy a sunrise game drive, at your own cost, or you can simply enjoy a relaxing morning and hearty breakfast at the lodge before making your way back to Johannesburg. You will have two comfort stops on the way back. You will have a late afternoon drop off by arrangement. During this safari, breakfast and dinner will be provided daily. You will have tea, coffee, and biscuits before early morning safaris depart and packed breakfasts for your trip. The rest of the payment should be paid 21 days before arrival. Safari With Us creates unforgettable safaris with personal attention to guests' requirements and ensures the best possible service and experience.